I have been fascinated by many claims that people do and stories that they tell about all kind of miracles. Last year something happened in my head: I suddenly could no longer give certain people and their claims the benefit of the doubt, that I had been giving them for years. More details about this later. But the realisation that some people are simply lying and cheating has been a relief. I have really tried to believe that there are other, better explanations, but I am afraid that Life is simply as it appeared to me in the 50 years that I had a change to witness it. Which means that there are no such things as levitation, ghosts, teleportation, alien abduction, time shifts, reincarnation and many other things that I have been thinking and reading about for decades. As an illustration for how idiot some people are, I share you a recording that I have on a cassette called ”God awful” . 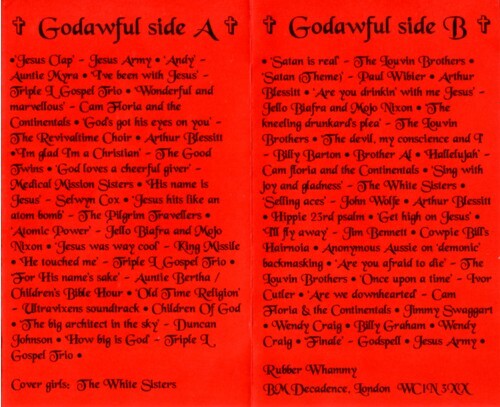 This is a compilation cassette with rare and weird religious recordings. The limit is this story. It comes originally from a 45. Recordings like these serve for me as hard proof of the fact that some people are plain idiot, and that it is not worth trying to understand them or whatever they are saying.